Kenneth Edward Shaw was born August 25, 1954 in Newark. His father bought him a pair of toy six-shooters when he was a boy and began calling him Two-Gun Pete. The name stuck. Pete grew up in awe of his brother Woody, 10 years his senior and destined to become one of the great jazz band leaders and trumpeters of the 1960s and 1970s. Athletic but somewhat undersized, Pete gravitated to football while attending Barringer High and starred for Frank Antonacci’s Blue Bears. He was stellar off the field, too, earning a scholarship to Northwestern, where he double-majored in Biology and History and captained the football squad under coach John Pont. The Wildcats were Big Ten doormats for much of Pete’s time with the team. They won just 9 conference games in his four varsity seasons. 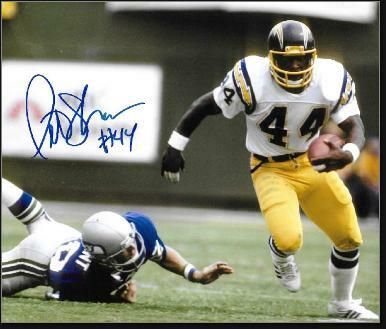 Even so, Pete drew enough attention for his smart and relentless play to be drafted in 1977 by the San Diego Chargers in the 7th round. With the Chargers, Pete was a jack of all trades. He was a valuable special teams player and also a starting defensive back for three seasons. He intercepted 12 passes for San Diego and helped them reach the playoffs in 1979 and 1981. In the 1981 AFC title game against the Bengals (famous for its –9 kickoff temperature), Pete recovered a fumble. But the Chargers fell 27–7. Pete returned home for his final three NFL seasons, joining the Giants in 1982. He was a leader on special teams and one of the Giants primary punt returners in 1983, averaging 8.1 per return. After football, Pete became a stockbroker. He worked as a sports agent starting in the mid-1990s before getting back into the financial industry as a financial advisor, counting among his clients several pro athletes. He lives in Southern California.